Happy September, everyone! Cooler temperatures and warmer colors are on their way. Fall is my favorite season of the year and the arrival of the “-ber” months makes me happy. I know many are sad to see summer ending, but it’ll be back again soon enough. I’ve stumbled across a few cool sites and tools and such to share. No better day than the first of the month to do so. I hope you find some of them as interesting and/or helpful as I have. First off, The Pudding: A Weekly Journal of Visual Essays. What an amazing find! This is a fascinating (and growing) collection of articles about topics ranging from culture to politics to sports to music, each enhanced by some terrific graphs and tables. It’s a great way to see how data visualization can be used to make essays more readable, understandable, and fun. Check it out! If you want to get cracking on your own data visualizations to accompany your writing, you can find all the inspiration and quick start you need at Stephanie Evergreen’s new collection of step-by-step guides to a whole host of charts. You will bookmark it and visit often. Guaranteed. ChartsBin is a useful site for finding and creating data visualizations. If making dynamic/interactive visuals for the web isn’t your forte (it’s not mine), a site like ChartsBin can come in very handy. Helping professionals write and speak without using the jargon of their field is a challenge. For scientists, the new De-Jargonizer tool can help. It’s a quick way to check how well a written piece translates to different levels of the general public. I’ve popped a few abstracts from articles into it and the results have been pretty good. It’s helpful to see which words/phrases might be edited for a lay audience. Lastly for today, my next big learning adventure in life is to launch a podcast. I’ve been wanting to do this for some time, but I struggled to come up with the right bent for it. I finally did and am now in the process of learning all about the ins and outs of creating podcasts. If you’re interested, I hope you’ll stay tuned for updates and tune in, once I take off. I can’t wait! For those celebrating the long weekend ahead, Happy Labor Day! Visualization is a game of decisions and to make good decisions you need to be aware of all of the options that you’ve got and then be aware of the influencing factors that shape what choices you can make. What skills have you got? How does that restrict or open up opportunities around chart types or interactivity? What are the formats that you happen to aspire towards and what does that impact in terms of the choices that you have to make for a given context? I so appreciated this statement for a couple of reasons. First, looking at the act of creating visualizations as a decision-making process gets to the heart of why and how visuals either work or they don’t. In other words, good decision-making is key to good visuals, regardless of all the know-how one might have in terms of tools and/or design. You need to start and end with good decisions. Secondly, you need to have some skills and the more you develop your skills, the greater number of choices you’ll have available to you in the decision-making process. “Aspire.” It’s a grand word. My story of creating visuals started on a Friday afternoon when I was staring at a spreadsheet/report that I’m frequently asked for in my work. It’s a tracking form of our clinical research scholars, telling the number of grants they’ve applied for, the number and percentage of said applications are funded, the amount of money associated with each, the number of publications they’ve written, and other such metrics that tell the UMCCTS their return on investment, if you will, for these researchers. As I was looking at it – and as it was a Friday afternoon and I was needing something fun to do to finish my work week – I wondered if I could draw a picture that told the same story that the numbers and information in this spreadsheet told. I like to draw, so I thought I’d give it a go. I wasn’t sure that my bosses would like it, but I figured it didn’t hurt to try. So I did just that and ended up with this: Surprisingly, my bosses loved it! And I was quickly asked to make some more, so I did. I made one to show how all five UMass campuses are involved with the UMCCTS. I made one highlighting the team science and/or collaborative nature of our sponsored programs. I made one showing the outcomes of our pilot awards, one illustrating the work of the Center for Microbiome Research, and one highlighting the peaks achieved by our Conquering Diseases Program. I covered my office door with them, put them in our monthly newsletter, and eventually we made a page on our Center’s website so that they live online. Of course, the more charts I made, the more folks came to me with requests to make more. Each was an opportunity to learn something new, to try something different, to make choices and decisions – some good, some bad, some better. I made slides for a presentation that our Quality Assurance leader was giving to a group of clinical research administrators. I made a tree map for the director of our Institutional Review Board. When I showed it to her she asked, “Where’s the pie?” So I made her a pie and she said, “You know, I like the tree better.” Yay! So did I. And then, taking Andy’s words to heart (before I even knew them) I read and learned and practiced and expanded my skill set, learning dot plots, split bar graphs, lollipop graphs, embedding labels, and creating both heat maps and bar graphs in R. (Thank you, Nathan Yau.) It’s fun and it’s appreciated and it’s become a big part of my job now. And so when people continue to ask me why I’m no longer a librarian or what an evaluator does, I reply, that I AM a librarian. I’m a librarian who does evaluation and now that I’ve added the drawing pictures aspect to my toolkit, my wife calls me an INFORMATION ARTIST! It’s the best job title that I’ve ever had, by far. What I hope everyone takes away from this talk – or this post – is that when it comes to being an information professional, the sky is the limit for all that you can do. Find what you like, find what you do well, find what you want to do, learn what you want to learn, and grow with the profession. It makes for a great career. 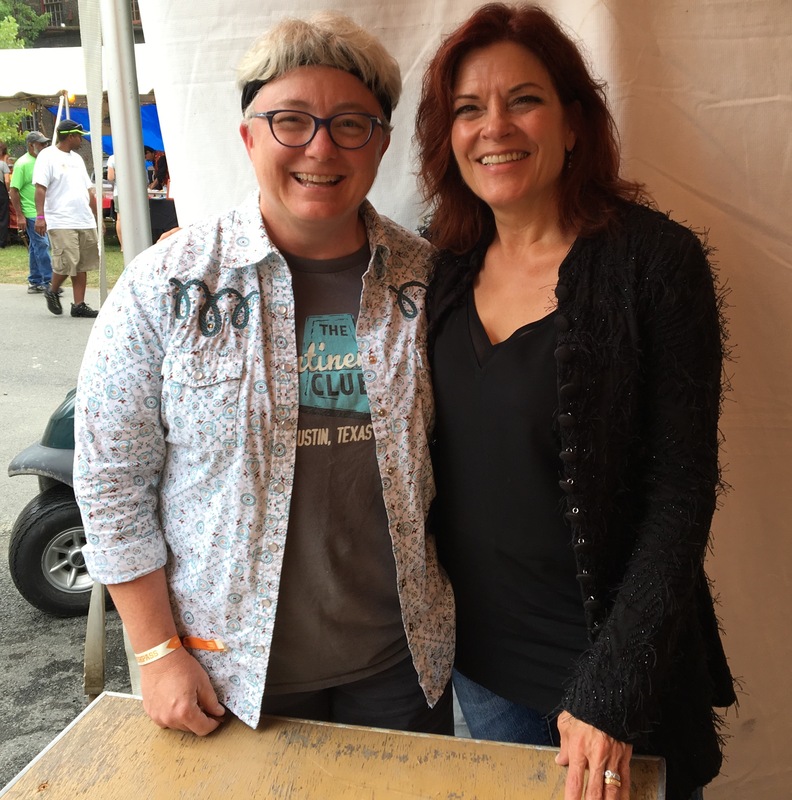 Rosanne Cash … always wonderful! I attended the wonderful 3-day music festival, FreshGrass, last weekend. I saw a plethora of talent and a whole host of favorite musicians including Rosanne Cash, Glen Hansard, Aoife O’Donovan, Sierra Hull, Ruthie Foster, Alison Brown … but WAIT! By this account, one might think that the festival was dominated by women, but alas, it was far from a reconceived Lilith Fair. No, no. 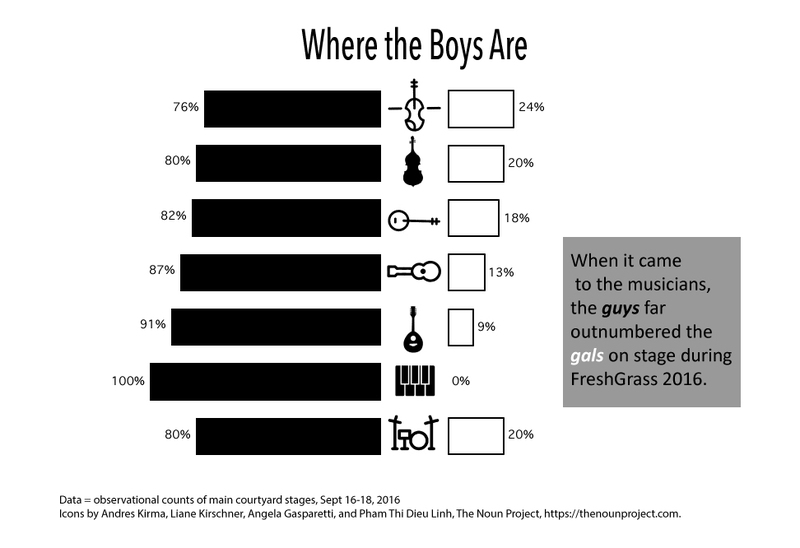 FreshGrass is a bluegrass / roots / Americana music festival and bluegrass / roots / Americana music is dominated by dudes. Rather than letting my feminist self get all riled up over the gender gap and put a damper on my fun (because when I get angry I tend to have less fun), I decided instead to make a little data collection and data visualization project out of the experience. That’s fun. You can see the total percentage of players, by instrument, in the first graphic. 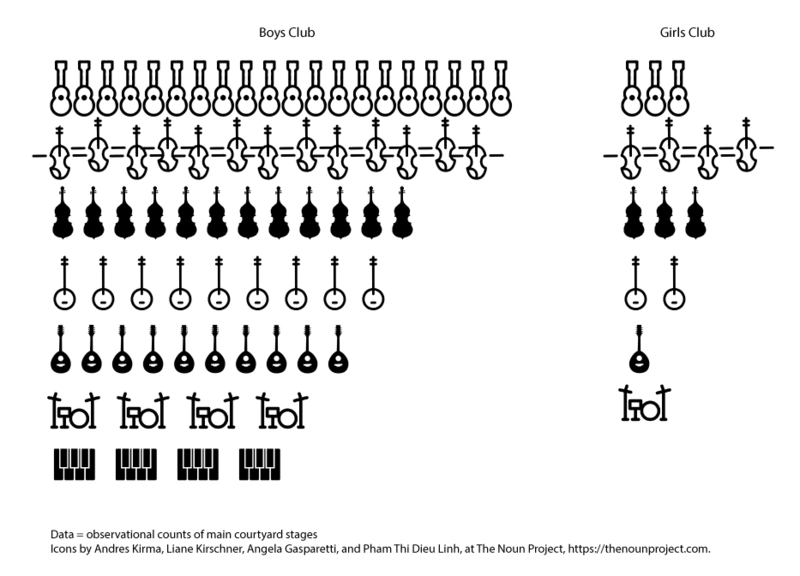 In the second one, each instrument represents one musician. I didn’t count all of the smaller groups on the courtyard stage and the pop-up performers (there were just too many to keep up with), but from casual observation, doing so wouldn’t have changed the results. What’s all this to say? Probably plenty, but I’m simply going to take it as motivation to keep practicing so that I can do my part to close the gap. The next time I put together a presentation and am tempted to do that requisite “Here’s What We’re Going to Cover in this Talk” slide, I’m going to use this technique rather than some boring list of bullet points. For sure. My friend and authorstrator, Suzy Becker, shared a wonderful article with me from the latest issue of Smithsonian magazine. The Surprising History of the Infographic will be required reading for the data visualization course that I’m putting together for next spring. And as I told Suzy, I’m changing my job title to “polymath.” I love it. If you’re interested in joining me in this new old vocation, writer Nir Eyal’s post, Three Steps to Get Up to Speed on Any Subject Quickly may be of help. “Google once, take notes, then stop Googling and start sketching” was perhaps my favorite bit of advice. 15 Data Visualization Tools to Help You Present Ideas Effectively has a few listed that I’ve yet to try. I’m always up for trying new tools. The Analog is a brilliant site for reviews of all things analog – you know, pens, paper, pencils and such. If you’re like me and read James Ward’s, The Perfection of the Paper Clip: Curious Tales of Invention, Accidental Genius, and Stationery Obsession in one sitting, you’ll love this blog. Design Observer is also a beautiful and enlightening blog that I came across through a tweet to its posts, 50 Books and 50 Covers. Books can be art, in more ways than one. Finally, July is always a month of celebrations and anniversaries. This very day marks the 47th anniversary of Apollo 11’s landing on the moon (Do you remember where you were?) and July 5th was the 20th birthday of perhaps the most famous sheep since Lamb Chop, Dolly. Yes, Dolly, “the first mammal cloned from an adult cell, was born July 5, 1996.” Scientific American’s story behind the story of Dolly is a fascinating summer read. Enjoy! Well, truth be told, I’ve not had a summer vacation just yet. Still, things do seem to slow down a little bit at work during the summer months and I’ve taken advantage of the time to learn a few new things that will hopefully make me better in my job. I thought I’d share some of them, along with resources in case you wish to add some arrows to your quiver, too. My challenge now is to make my own library, to build my own collection of resources, and to keep them current so that those stressful “by the end of the day” requests are less so. Enter spreadsheets, pivot tables, and dashboards. I was hardly a novice Excel user when I started this work, but enough reading in the literature and best practices of evaluation led me to believe that I needed to expand my know-how about Excel in order to make things easier for myself. After my last scramble to fulfill a “just in time” request, I decided to get to it. I read two excellent books on data visualization that base most of their material on examples from Excel; Cole Nussbaumer Knaflic’s, Storytelling with Data, and Stephanie Evergreen’s, Effective Data Visualization. These are both great, hands-on books to get you going. I also came across Excel Campus, with one of the best series of video tutorials I’ve ever viewed. The 3-part series on building pivot tables and dashboards was just what I needed. With these new skills, I’m able to take lengthy, unwieldy (to me) spreadsheets and turn them into several separate sheets with associated pivot tables for analysis and interactive dashboards that let me quickly see the who, what, when, and where of our different programs. It’s a work in progress, but I can tell already that it will be helpful for me and – hopefully – when I develop more tables based upon the questions of the Center’s staff, it will be helpful for them, too. Next up, I wanted to learn how to create both an overlapping bar chart and a heat map. I was inspired to learn the former from a blog post that I read, coupled with the task I had of writing a report summarizing the evaluation results of our annual research retreat. You know, when you create a survey to evaluate an event (a class, a retreat, a workshop, etc. ), you’re often stuck with a whole bunch of questions producing a whole bunch of bar graphs showing how much people appreciated this, that, or the other thing about the event. My survey for the retreat was no different, but I knew that there had to be a better way to present the findings – “better,” meaning a one-page document. Overlapping bar charts seemed perfect. As you can see, I was able to use this type of chart to combine the results of several questions into one visual, making things a lot easier to read and a lot shorter in format. Five charts become one with an overlapping/stacked bar chart. Now the heat map. Why? Oh, I don’t know. It was last Friday and a quiet day. And they’re kind of cool looking, so … back to tackling R for analysis and visualizations. (My goal here is to be able to be comfortable with these tasks in Excel, R, and Tableau, thus I switch off between them, to hone some skills.) I’ve mentioned here before that I find Nathan Yau’s books and website, Flowing Data, to be essential to understanding and doing data visualization. To learn (better said, “follow the instructions”) to make a heat map, I used the example that he offers in his book, Visualize This, but he also makes this particular exercise available in his collection of online tutorials, so you can have at it, too, if you wish. As you can see, I did indeed follow the instructions and made a nice little heat map of NBA players’ stats. I also wanted to try making a heat map in Excel (easier said than done, though you can find resources online). I downloaded the data from my Jawbone fitness band that I’ve been wearing since December and made a nice map of my daily step count. Nothing fancy, but it worked just fine as a learning exercise. I still plan to tackle making heat maps in Tableau, as well as other dashboards and charts that will be useful. The tool kit is never full and the summer isn’t even half over yet. It’s not a good sign for my summer that I lost an entire month of the spring. Ah well… it was a different sort of month, filled with some work events and an unexpected life event that kept me away from my computer for more than a week. But before the entire month passes, let me share some things from my “To Share” folder and keep my streak of active blogging months alive. I’ve been blogging here for going on 4 years and have never had a month without a single post. It’s not happening now! If you work in the biomedical research world – or heck, if you simply follow any news about biomedical research – you’ve surely heard the acronym, CRISPR in the past year or two. The discovery and use of Clustered Regularly Interspaced Short Palindromic Repeats, CRISPR, for editing genes has been an enormous breakthrough in science. It’s also, per this article in Nature, a new and important key for understanding how genomes work. Curious about how it can be applied? Here’s a fun quiz from the folks at Wired magazine, Can You Tell These Real CRISPR Projects from the Fake Ones? Wonder what it might be like to enjoy the rat race? Researchers do an awful lot of things to our rodent friends for the sake of science, but did you know that they actually enjoy some of them? The rodents, that is, not the scientists. Here’s a fun piece from the blogger, GrrlScientist, Wild Mice Actually Enjoy Running on Exercise Wheels. One day, cephalopods will rule the world? Do you doubt me? Here’s proof. I may have shared this in a previous post, but even if so, it’s worth sharing again – Flowing Data’s 10 Best Data Visualization Projects of 2015. You can be both wowed and inspired by reviewing them. It goes without saying that librarians are hardly the only professional group retooling to adapt to a data-driven, data-overflowing world. Journalism has also become a profession that looks very different from what it did just a few short years ago. Journalist Geoff McGhee’s video report, Journalism in the Age of Data, is a great piece that chronicles and explores how news rooms are changing and adapting to be able to effectively use data to tell stories. Self-reliance is built in part on people’s ability to answer their own questions, which is closely related to the concept of self-service analytic, especially in today’s data-driven age. For many, the idea of self-service business intelligence, where IT opens up a small menu of capabilities for employees, has not yet produced its promised benefits despite having been around for a few years. It is clearly an improvement on the traditional, IT-run report factory, but it is still too limiting to satisfy people’s ever-growing appetite for information. So far, self-service BI is more like IKEA’s approach to DIY furniture-making. While it allows us to build our own furniture, it’s limited by factory-manufactured building blocks. As a result, we all end up with the same results despite the process being self-service. This is not enough when it comes to fostering self-reliance, autonomy, and innovation. An alternative approach is to give curiosity-driven users a new generation of tools, which will enable them to explore their data and answer their own questions on their own schedules. I loved the Do-It-Yourself IKEA-approach metaphor. I’ve been reading Cole Nussbaumer Knaflic’s book, Storytelling with Data: A data visualization guide for business professionals. It’s succinct and straightforward style is terrific. It’s also filled with many excellent examples and step-by-step exercises, all using Excel. Her blog of the same name is also worth checking out. You might note that she’s on a bit of a hiatus after welcoming a new baby to her family, but there’s plenty of archived info worth perusing. Along the same lines, you may also want to read Scott Berinato’s article in the June edition of Harvard Business Review entitled, Visualizations that Really Work. Track the pulse of the US presidential race via Twitter. Just for fun. One of the best articles I read this month was an inaugural essay for the brand new Journal of Design and Science (JoDS) out of MIT. I admit that I had to read it a few times through and consult a few outside resources to fully understand it, but once I got it, I got it! Age of Entanglement, by Neri Oxman, proposes a very interesting theory to explain how the dissolution of clear boundaries between disciplines and specialties breeds (and thus, needs) new means of understanding how people work, think, and create both individually and together. And the Krebs Cycle of Creativity is brilliant! Source: Oxman, N. (2016) Krebs Cycle of Creativity (KCC). In: Ito, J. Design and Science. If you’re ever looking for good, online writing related to science, ScienceBlogs is a nice, one-stop site for finding blogs pertaining to all types of disciplines, including Information Science. A future read will be the Journal of New Librarianship a brand new, open source journal to promote innovative practices in librarianship. They’re seeking submissions, editors, and reviewers. I know I’m planning on contributing in the future. How about you? Benchmarking with SciVal in Scholarly Communication and Research Services is a great article by my friend and colleague, Rebecca Reznik-Zellen, Lamar Soutter Library, UMass Medical School. Bibliographic metrics have long been used to measure academic reach and impact, and many tools are coming online to improve and expand this method. SciVal, from Elsevier, is but one of them. Whether you have access to it or not, Rebecca’s piece gives a nice overview of how offering research impact, i.e. the measurement of it, as a scholarly communications and/or research service is right in line with the mission of any academic research library. Do you wonder how people make those short animated GIFs that appear all over social media today? GifSoup is one way. Here’s a quick tutorial. Here’s a quick and easy way to clear up some memory in your iPhone, iPod, or iPad. And learn from my mistake – choose a single movie, NOT a bundle. I did the latter and am now stuck with the Lord of the Rings movie trilogy. Ugh! I’ll never watch them. I missed attending MLA in Toronto this month, but followed along with all of the tweeters using the #mlanet2016 hashtag. Thank you so much to those who kept us stray folk in the know. One of the best sessions I followed was an early morning one devoted to new text mining tools. So far, I’ve had the chance to play with Voyant Tools. It’s simple to use, easy to understand, and is a wonderful addition to the toolkit. Good Night, Sweet Prince – Another musical and artistic genius left us recently. This isn’t necessarily a “fun” piece, but it’s a beautiful article by Dave Ziren for The Nation. For those of us my age, Prince was our David Bowie. His music lives on, though his fans will miss him forever. Download 448 Free Art Books from The Metropolitan Museum of Art – Why would you not?? Last month, the Smithsonian online magazine published some hidden gems by the reclusive, Harper Lee. Great stuff! Mother Goose Seeks Out Police to Rescue Baby. Who doesn’t love these stories in spring? And do note how it was the female police officer who took direct action. The male officer was too scared. Maternal instincts taking over? I think so. Hilda Bastian is a scientist and editor at the National Center for Biotechnology Information (NCBI) of the National Institutes of Health. She also draws cartoons about science. The National Library of Medicine produced a nice interview with her here. If you happen to be a person who recalls with fondness those Saturday evenings watching slide shows and home movies, you might really enjoy the Home Movie Registry. Yes. It exists. Thank you interwebs. That’s all for today and, sadly, all I shared for the month of May. I’m sorry I didn’t write more. I’ll try and do better in June.